Cesar Diaz also known as Power Ranger (7-0, 6 KOs) was a shining star in the Golden Boy Promotions stable of fighters. Managed by Joel Diaz, Trained by Samuel Contreras Sr., Cesar was aspiring to one day win the WBC Green Belt. 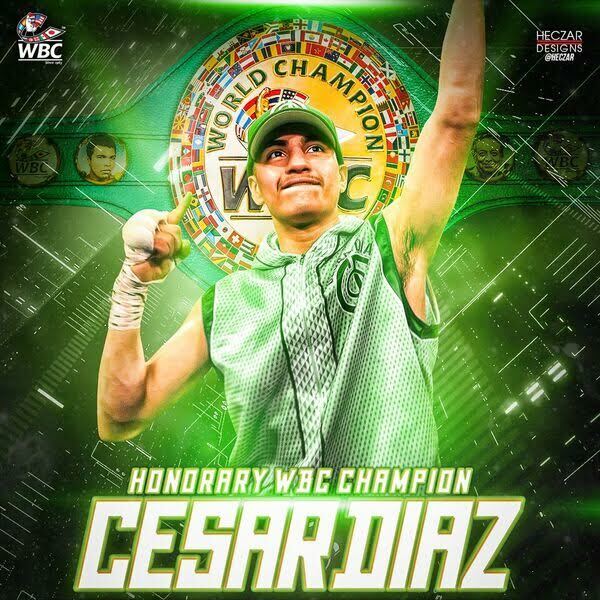 Today on behalf of WBC President, Mauricio Sulaiman, the WBC appoints Cesar Diaz as our WBC Honorary Champion. Cesar had an impeccable amateur record, beating some Top prospect Professionals in their days as amateurs. He fell in love with the sport of Boxing and accepted the discipline and hard work that came with it. Cesar Diaz’ pro debut was televised for this reason, he was an exciting fighter with a great future in Boxing ahead of him. We have no doubt one day he would compete for the Green Belt. Outside of the ring, Cesar was a kind human being, with a big heart and a priceless smile. For this and so much more, its only right to say Farewell like a Champion. WBC will be present at his services December 14th from 4pm-8pm to make this formal announcement to his family and friends. On behalf of Mauricio Sulaiman and our entire WBC Family, we send our deepest condolences to the Diaz Sandoval Family, as well as his Boxing Family Samuel Contreras Sr., Sammy Contreras, Eddie Aguilera, Joel Diaz and the Golden Boy Boxing Team.